In 1985, David Suchet played Inspector Japp in a film of Agatha Christie’s Thirteen at Dinner with Peter Ustinov as Poirot. Fortunately he wasn’t very good. Had he been, he may never have taken on the role of Poirot himself. Suchet, of course, played Christie’s fastidious little Belgian detective in 74 telemovies over 25 years, winning millions of fans around the world. In between his Poirot commitments, he returned regularly to the stage though he wasn’t able to undertake a long run. 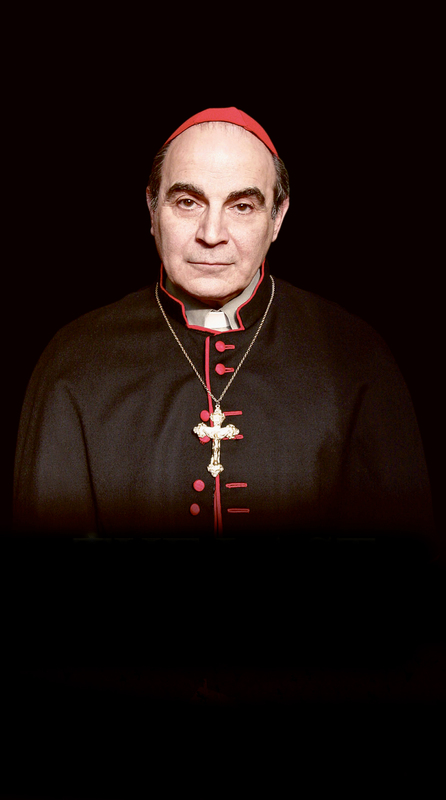 However, after Poirot’s death in the final episode last year, Suchet now has the time to tour internationally in a play by Roger Crane called The Last Confession, currently in Australia. Set in the Vatican it is billed as “a thriller” set around the sudden (some think suspicious) death of Pope John Paul I in 1978. Next, he plays Lady Bracknell in Oscar Wilde’s “trivial comedy for serious people” The Importance of Being Earnest in London’s West End. During a quick media stop-over in Sydney before the start of the tour in Perth, the thoroughly charming, genial British actor took time to talk about saying goodbye to Poirot, his current role in The Last Confession, his conversion to Christianity, Twitter and the chance to play Lady Bracknell. Jo Litson: You have talked about the end of Poirot being like saying goodbye to a dear friend. Has it been very emotional? David Suchet: It was and it is. I can’t really be allowed to let him go at the moment because I’ve just been in this play The Last Confession in Los Angeles and Canada and the last five episodes of Poirot are just being aired there now so when I was there I was doing publicity for Poirot – and that’s a year after I’d finished the series. So, in fact, I haven’t been able to put him to rest. Maybe I’m beginning to from now. You’ll miss him a lot presumably? I’ll miss him very much, but he’ll always be (screening) somewhere. What would you say if they asked you to play him in a film? I’ve always said if there was a movie to be made of one of the stories I would consider that, because it would be like revisiting one of Agatha Christie’s stories before he died so I wouldn’t mind that. And it would be in a different medium. I’d never do him again on television. I have been asked to do him in the theatre but my theatre career has always been very distinct and separate from Hercule Poirot. Of course, I’d be tempted to do him in the theatre but I don’t feel, with the best will in the world, that it’s right for me to bring that character into my theatre repertoire. I think it may overshadow what I’ve done in 45 years. I’ve performed in these great plays – Joe Keller in All My Sons, Tyrone in A Long Day’s Journey Into Night, George in Who’s Afraid of Virginia Woolf?, Iago in Othello, Prospero in The Tempest – and then suddenly Poirot? You’d have to ask why, wouldn’t you? So it would be for the wrong reasons. I have to let him go. There will be other Poirots sooner rather than later, I’m sure, and I must be generous and magnanimous and wish them luck and hope they have a huge success with it. But I have to let him go in exactly the same way Sean Connery had to let James Bond go. It was his decision to let go. It’s not my decision to let go but I’ve done all the stories now, there are none left to do so that’s it, I must say goodbye. You were in an early film when Peter Ustinov played him? Yes, I played Inspector Japp. He (Peter Ustinov) was such a lovely man. He was so generous to me when I took over and wished me all the luck, publicly as well. But I have to say that I am only grateful that when I played Inspector Japp with Peter Ustinov that I gave such a bad performance. I’ll tell you why. Peter went on to do four or five other films after that with the same cast so if I’d been good I would have been Inspector Japp in all those other films. I would never than have been asked to play Poirot. I believe your involvement with The Last Confession goes back to before the play premiered in Chichester in 2007? About three or four years after that it was sent to me again having been reworked by the writer and it was much, much better to the extent that I was really interested in this play now and went to New York and worked with Roger Crane on my own to develop it even further. Then the producers came on board and then we got a director and he took over that job. Because of Poirot I only had time to do six weeks in Chichester and 10 weeks in the West End. And ever since then the producers have wanted to do it again and I’ve never been available so now that Poirot has died it’s the first time that I have suddenly been free. I wanted to do it again because I wanted to re-explore the character. I hadn’t really finished in a sense. Apparently it’s thanks to you that the play is touring Australia? We were always going to go to Canada and Los Angeles and I said to Paul Elliott, our producer, I’d like to go to other English speaking countries who have supported my Poirot all these years. Can we please go to Australia and South Africa? He tried both. Australia had (theatre) vacancies and wanted it. South Africa wanted it but had no vacancies at the time so this is why I’m now here. It’s all part of my desire to come and, in a way, say “thank you”. I have a huge fan base here. When Poirot is showing in Australia I always know it’s being shown because my mail bag is huge and I get messages on Twitter saying “I’m now watching you in Sydney or Brisbane…” and it’s always such a thrill for me that my program is being watched on the other side of the world. Now that I’m in Sydney I get stopped in the street and people are so charming and I’m so pleased to be here on stage doing something completely different and, in a sense, saying thank you. Do you do you own tweets? I do. People are always surprised. I don’t do it that often. I don’t have that many followers for a so-called star. (He has 29,000). I get on Twitter about once a week and do a few lines here and there but at least they know it’s me. I never wanted to do Twitter. It was when I was in All My Sons in the West End, the publicity department said I had to and they offered to run my Twitter page for me. I said, “well, if I’m going to do it, I know my Poirot fans are going to want to ask questions and things like that, which you wouldn’t be able to answer so I’ll do it on my own.” I don’t get into conversations but when people say nice things I get back and say thank you. Superficially there would seem to be some similarities between Poirot and The Last Confession: a thriller with a possible murder? That’s publicity from a long time ago. The play is not a whodunit. To a certain extent nobody will ever know who dunit if they did do it. Pope John Paul I was found dead in his bed 33 days after starting to be the most radical, reforming pope in the history of the Catholic Church. He was everybody’s idea of the parish priest, the “smiling pope”, the people’s pope, the pope that didn’t want to be carried on a throne for his coronation. Sound familiar? Yes, sounds a bit like Pope Francis doesn’t it? My character Giovani Benelli, an archbishop originally, was a great friend of Albino Luciani who was to become Pope John Paul I and really got his friend into the papacy. He then becomes a cardinal and his friend having become Pope is found dead in his bed. My character then feels such pain and guilt that he has this great struggle of faith. So this play is as much about the struggle of this man as an investigation into the possible causes of the untimely death of this great pope. 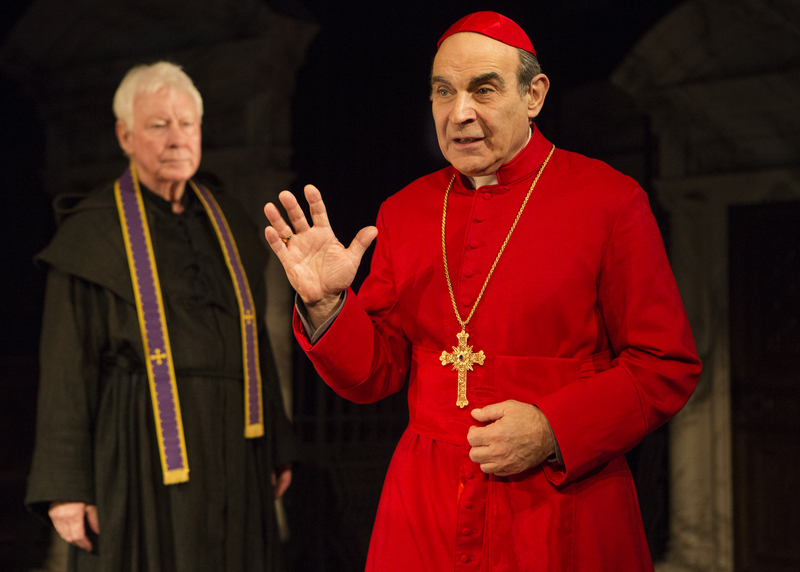 So it’s a play that will take you into the power politics of the Vatican. Yes, we may be walking around in scarlet robes all 20 of us but you could be entering parliament. I believe your wife (Sheila Ferris) is in it? Yes, she is playing the only female role in the play – a nun who takes care of Pope John Paul I. It’s a very long time since she was on stage, over 20 years. She gave up a wonderful career to look after our children, bless her, and this is an opportunity for her to come back, and she’s really enjoying it. You have recorded an audio book of The Bible. That’s quite some undertaking? Apart from being a Christian – and I do have a very strong faith – I’ve always found that The Bible is a library of books. We’ve got drama, we’ve got poetry, we’ve got allegory, we’ve got songs, we’ve got history, we’ve got everything in The Bible. As somebody said, it’s the greatest book in the world. For an actor to read it from beginning to end is massive, and it took me over 200 hours. I’m so pleased I’ve done it. Is it true you converted to Christianity after reading a Gideon’s Bible in a hotel room? I looked in the drawer beside the bed for the Gideon’s Bible and it wasn’t there so the next day I managed to get the New Testament and I started to read. I thought I’d read somebody who actually existed so I read one of the letters of Paul. I’ve always been interested in Rome so I read his letters to the Romans. The first half of the letter I didn’t understand at all but then I found a way of existing in the second half of that letter in the Book of Romans that I’d been searching for all my life: how to relate to other human beings and how to be a human being. I thought this is great and suddenly I found a worldview, suddenly I was looking through a lens that made sense to me. Then I had to discover where did Paul get this from and it was from Jesus so that led me to Christianity. I’m going to be in The Importance of being Earnest. I’m going to be playing Lady Bracknell in the West End. I follow in the great shoes of Geoffrey Rush (who played Lady Bracknell for Melbourne Theatre Company in 2011). It’s not the first time this cross-gender casting has been done. A number of actors have played Lady Bracknell and roles like Viola. And actresses – though you can’t say that anymore – have played roles like Richard II. But it’s a chance for me to embody a wonderfully written comedy role. I’m really looking forward to it. So I change from playing a cardinal to a lady. What an amazing career for an actor of my age! I’m so lucky. 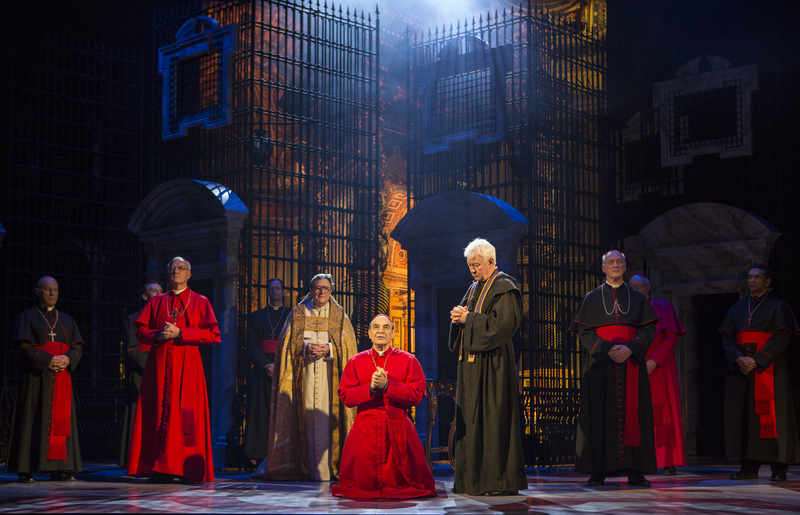 The Last Confession is at His Majesty’s Theatre, Adelaide, August 27 – 31; Comedy Theatre, Melbourne, September 3 – 21; and Theatre Royal, Sydney, September 24 – October 5.